Central Saint Martins goes back to its roots with an exhibition of recent graduates in the crypt of London’s St-Martin-in-the-Fields. St Martin’s School of Art was established in 1854 by St Martin-in-the-Fields. The Reverend Henry Mackenzie and others were concerned that art and design training should be developed alongside the religious and general education already provided by Church schools, to “extend the influence of science and art upon productive industry” following the Great Exhibition of 1851. The art school soon became independent, and over a century later in 1986 merged with Central School of Art and Design to become Central Saint Martins. 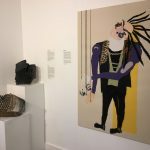 This exhibition, curated by Angela Sanchez del Campo and Central Saint Martins’ former Dean of Academic Programmes Mark Dunhill, reconnects the two institutions. 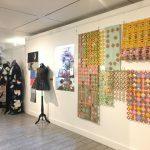 The work spans across the College’s disciplines from textile work that visually interprets experiences of mental health and artwork that captures the fragility of the human experience to graphic design inspired by William Hogarth and speculative and ritualistic religious fashion design. Over 150 years later, the link between the two institutions remains the belief in the power of creativity as a catalyst for change in both individuals and the wider community. 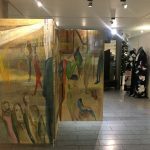 “central saint martins in the fields”, an exhibition of work by recent art and design graduates from Central Saint Martins, is in the Crypt of St Martin-in-the-Fields, Trafalgar Square, London WC2N 4JH, 5 October – 4 November 2017.